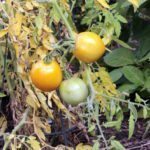 I got my tomato plants planted quite late and they are blooming; however, they have yellow leaves at the bottom of the plant. I had beautiful plants and lots of tomatoes last year and had them in the same place. We have had ample rain and when I water, I water only the bottom of the plant, soil mostly. What could be my problem? I have no pets around, so that is not the reason. first of all avoid to plant vegetables like tomatoes in the same area year after year....this can spread diseases and cause lucked of nutrients. another thing is that you may have a problem with spider mites...spray your plants with neem oil specially under the leaves, once a week.